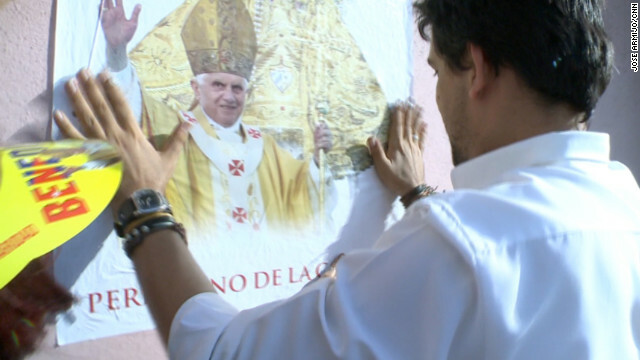 A poster of Pope Benedict XVI in Havana’s Plaza de la Revolucion, where he will celebrate Mass amid icons of Cuban communism. Santiago, Cuba (CNN) - Facing the stage where Pope Benedict XVI will deliver his first Mass in Cuba during his visit here this week is a giant neon billboard of a young and victorious Fidel Castro brandishing a rifle. It would appear to be a poor omen for the pope’s visit, if not for the message printed beside the Cuban leader: “Rebels yesterday, hospitable today, always heroic.” It’s the slogan for Santiago de Cuba, the first stop on the pope’s three-day trip to the island nation. The freshly erected sign offers insight into the changing, often hard to read, relationship between the Cuban government and the Catholic Church. After decades of chilly relations between church and state here, including the near dismantling of Cuba’s Catholic Church in the 1960s, the Castro regime is rolling out the welcome mat for the pope’s visit, even if it is offering no apologies for its past actions. “Our country is honored to receive his holiness with Cuban patriotism, learning, vocation, solidarity and humanity,” read a front-page editorial published last week in Granma, the Cuban Communist Party daily newspaper, which on most days offers scathing critiques of life in the United States and glorified recountings of the Cuban revolution. In the weeks leading up to the pope’s arrival, Cuban church leaders have been given greater freedom to speak publicly. Sites the pope will visit are undergoing hurried beautification. And in Havana’s Plaza de la Revolución, an altar is being built where the pope will deliver mass to crowds expected to be in the hundreds of thousands. For Pope Benedict, the altar stands in the center of the plaza, the same place where Fidel Castro delivered many of his most incendiary speeches at the height of the Cold War, a point remarked upon by many Havana residents. But is the leader of the global Catholic Church receiving more than just lip service from the secular and once officially atheist Cuban state? And to some extent, some of those openings have taken place. The church suffered greatly in the backlash, with most of the country’s priests leaving for exile. Religion was transformed into a topic to be discussed in whispers. But life for Cuba’s Catholics changed with the collapse of the Soviet Union and the lead-up to John Paul’s visit. Christmas was reinstated as a holiday. Cuba went from being an officially atheist state to a secular one. Cubans were told by their leaders for the first time that they could be both openly religious and members of the Communist Party. Now it is commonplace to see Cubans wear crucifixes and baptize their children. Church attendance, while still low, has rebounded. But in spite of those advances, many here feel that John Paul’s call for greater openness has still not been realized. “Perhaps the church can make a case that it’s looking at this whole thing long-term, by small incremental steps, maybe the church feels it’s moving the regime to a more open stance, more democratic reforms,” said Daniel Alvarez, a Religion Professor at Florida International University. Outside Havana, a Catholic seminary opened just more than a year ago, the first building Cuba’s government has allowed the church to build since the revolution. The seminary is home to 50 aspiring priests. They are the future of the Cuban church, says seminary rector Jose Miguel Gonzalez, and symbolize the strides the church has taken here. The church, Gonzalez said, is increasingly being sought out by once ardent supporters of the revolution. But critics argue that the Catholic Church has more resources and power than any other nongovernmental organization in Cuba and that it uses them far too cautiously. Last week, 13 self-described dissidents occupied a Havana church for three days, refusing to leave until their demands to speak with the pope were met. After failing to negotiate the group’s exit, church leaders called in Cuban police, who removed the occupiers. On Sunday, mre than 70 women who are members of “the Damas de Blanco” group were also detained before being released. The group – all women – hold weekly silent protests outside a Havana Catholic church asking for greater personal freedoms and the release of jailed family members. While the state calls the women “mercenaries” in the employ of Washington, their protests usually do not lead to wide-scale police action. It is not known how much the pope, a fierce critic of secularism, will press for greater religious freedom when he addresses the Cuban people and meets with President Raul Castro. During that private meeting, church officials said, Raul Castro’s family has also been invited and officials anticipate that ex-President Fidel Castro may also be present. If so, it may mark the first time a pope meets with a current and former leader of a communist state. During a rare speech on Cuban-state television last week, Cardinal Jaime Ortega y Alamino said the pope’s visit is meant to address questions of faith, not politics. Some of that resurgent faith has been on display in recent weeks, when the Cuban church was allowed by the government to perform the via cruxis, public re-enactments of Jesus Christ’s crucifixion. As a cooling breeze blew in from the nearby seafront on Friday in the Havana suburb Alamar, a procession of the faithful carried a wooden Jesus Christ through a maze of crumbling, Soviet-built apartment buildings. Addressing the small crowd that gathered for the evening ceremony, Ortega told them to arrive at Mass at Havana’s Plaza de la Revolución early and to wear a good hat to protect them from Cuba’s blazing sun. The pope, he told the crowd, was traveling to Cuba to mend wounds from the past. But building bridges in Cuba, where old divisions still stretch wide, may be a fearsome challenge. Even for a pope. Patrick Oppmann is CNN’s correspondent based in Havana. He also was in Cuba Pope John Paul II’s visit to the island. Follow Patrick on Twitter @CNN_Oppmann for updates on the Pope’s trip to Cuba. Thanks for your advice on this blog. Just one thing I would choose to say is always that purchasing electronic devices items over the Internet is not new. In fact, in the past 10 years alone, the market for online electronics has grown drastically. Today, you will discover practically any type of electronic unit and gizmo on the Internet, which include cameras along with camcorders to computer elements and video games consoles. I found this site by mistake, but wanted to read this post. I recommended it to a friend to check out. Cheers! 2045 The faithful will use their cmmoon sense when and if they are exposed to this hopeless translation, as happened in South Africa. But they will be muddled and mystified not only by confused people who claim that Vatican I and II teach that only the Pope is infallible and deny that Vatican II refers to the infallibility of the People of God, and who make every criticism of the liturgy a criticism of episcopal and papal authority on matters pertaining to divine Revelation but also by prelates like Cardinal Napier who will treat them as rebellious and tell them to shut up. Most people will wisely decide not to get involved in such a fight, since they have not the equipment for it, and have not the time to waste dismantling the mystifications. Many people will seek a meaningful liturgy in another Christian Church (or non-Catholic ecclesial community as the Vatican would put it). I wonder if the Hitler Youth Pope tried to get Castro to put the big studded candle in the rectory or if he had the alter boys do that as usual....did he try to put his host in his mouth too? When Christianity was a small beleaguered sect, the Romans called them atheists as they (Christians) did not believe in the gods of the prevailing power. Currently atheists just believe in one less god than the Christians. Nothing more. Yet, these "nonbelievers" live moral and ethical lives. Christians are no more moral or ethical than their atheist counterparts. Its just that atheists don't claim the piety that Christians believe is bestowed to them when they are "cleansed" of their sins. What is not good for children are myths. What is not good for other living things is believing that these living things are purely here for our use/benefit as opposed to co-existence. And such has been the history of mankind in the name of one's religion. As far as the visit of the Pope to my Cuban homeland, my question is: did he bring with him the cologne he commissioned for himself? Where is the piety in that? Plus don't forget. The statistical studies from the nineteenth century and the three CCU studies on prayer are quite consistent with the fact that humanity is wasting a huge amount of time on a procedure that simply doesn’t work. Nonetheless, faith in prayer is so pervasive and deeply rooted, you can be sure believers will continue to devise future studies in a desperate effort to confirm their beliefs.! The Catholic pope ("Rats" Ratzinger) was a Nazi, as everyone knows, in Hitler's army. True – and it makes perfect sense since Hitler wrote that he was doing god's work by exterminating the jewish people. It's amazing how uniformed people are, they keep mixing Communism and atheism. Communism or Nazism is a delusional doctrine quite similar to religion. Atheism is not a belief system as such. It's not a dogma like any of the above. Actually, there are no atheists (the word "atheist" just means that the person doesn't believe in God specifically) – just rational people that reject delusional beliefs of any kind. Communists were atheists because it suited their dogma (religion and Communism are two very similar dogmas, and as such cannot and will not ever exist together as one competes with the other for the brainwashed minds of the people). That doesn't make atheists Communists. Nazis used Christianity to suit their dogma. That doesn't necessarily make all Christians Nazis (although many of them were and still are)!